Written by Dana Carlisle Kletchka, Co-Editor of ArtMuseumTeaching and Curator of Education, Palmer Museum of Art. The number of resources that currently exist for art museum educators. When I began my graduate work in the field in 1995, I struggled to find excellent sources for inspiration and professional development. The situation is far, far different now—there is so much exciting work being done. The ways in which ArtMuseumTeaching.com, as a digital community of practice, can support and encourage the progress and evolution of our field in ways that are both powerful and palatable. We are all incredibly busy, but somehow we make time for a source of information that is powerful, well-curated, social, and welcoming. American Association of Museums’ Education Professional Network (EdCOM) advances the purpose of museums as places of lifelong learning, serves as an advocate for diverse audiences and educators, and promotes professional standards and excellence in the practice of museum education. ArtMuseumTeaching.com is a digital community and collaborative online forum for reflecting on issues of teaching, learning, and experimental practice in the field of art museum education. It is the goal of this site to connect educators, ideas, and resources around a dialogue about what we do in our practice of teaching and learning. Bank Street College Museum Education: Childhood, Museum Education (Non-certification), and Leadership in Museum Education programs. The programs emphasize the educational role and mission of museums in a pluralistic society by providing a sound foundation in human development, learning theories, developing learner-centered classroom curricula, and museum policy and practice. Faculty are drawn from both teaching and museum backgrounds and include working museum professionals. The programs combine course and field experiences in both schools and museums. Canadian Art Gallery Educators (CAGE) is a non-profit association of educators and museums across Canada. Formed in 1989, CAGE has a long history of providing support for gallery and museum educators. Committee for Education and Cultural Action (CECA) is one of the oldest international committees of ICOM, and as such it achieves the major objectives of ICOM: the exchange of scientific information at an international level, the development of professional standards, the adoption of rules and recommendations, and the realization of collaborative projects. Engage.org engage is a membership organization representing gallery, art, and education professionals in the United Kingdom and over 20 countries worldwide. engage promotes access to, enjoyment, and understanding of the visual arts through gallery education. Group for Education in Museums (GEM) is a European organization that champions excellence in heritage learning to improve the education health, and well-being of the general public. Samuel H. Kress Foundation supports the work of individuals and institutions engaged with the appreciation, interpretation, preservation, study, and teaching of the history of European art and architecture from antiquity to the dawn of the modern era. Among their broad support for art museums, the Kress Interpretive Fellowship provides a new kind of mentored professional development opportunity intended to encourage students to explore interpretive careers in art museums, whether as future museum educators or curators; to strengthen the profession of museum educator within the art museum community; to strengthen ties between museum educators and curators in the shared task of interpretive programming in art museums; and to expand the range of promising career options available to students of art history and related fields. LEM: The Learning Museum Network Project is a permanent network of museums and cultural heritage organizations to ensure that that can play an active role with regard to lifelong learning and to raise awareness among decision makers at a European level. Marcus Institute for Digital Education in the Arts (MIDEA), a project of the New Media Consortium provides timely, succinct, and practical knowledge about emerging technologies that museums can use to advance their missions. Museum Education Monitor tracks and records research and resources in museum education worldwide. The aim of MEM is to help create a “road map” to new and current learning in museum education. Its goal is to enhance the development of theory and practice in the field by both academics and museum workers. Museum Education Roundtable fosters professionalism among museum educators by encouraging leadership, scholarship, and research in museum-based learning. MER also publishes the Journal of Museum Education, the only journal printed in the United States devoted to the theory and practice of museum education. Museum-Ed strives to meet the needs of museum educators by providing tools and resources by and for the museum education community. Museum-Ed is a not-for-profit organization dedicated to providing museum educators opportunities to ask questions, to exchange ideas, to explore current issues, to share resources, to reflect on experiences, and to inspire new directions in museum education. Museum-Ed is not a membership organization. All of the resources on the Museum-Ed Web site are free and available to educators in any type of museum, and anyone interested in the field of museum education. National Art Education Association’s Museum Education Division advances the mission and vision of NAEA, advocating for the value of art museum education in lifelong learning, as well as promoting the needs of educators and the diverse audiences museums engage. The division builds community and develops leadership, advances research and knowledge, and fosters a culture of learning in the field. University of Texas Master of Arts (MA) in Art Education with a Museum Focus. The purpose of the Master’s Degree Program in Art Education is to provide students with the opportunity, environment, and resources to explore issues in art education, conduct research on a significant aspect of art education, and enhance their knowledge of art and art education. Many thanks to Kris Wetterlund and Scott Sayre of Museum-Ed for endeavoring to bring this meeting to fruition while being the most gracious of hosts; to the Kress Foundation for supporting and and participating in this significant event; and to Maketa Wilborn for his ability to summarize, understand, and represent complex issues and ideas. Maketa Wilborn’s graphic interpretation of the AMECO meeting. Click on image to see a larger view. Participating Organizations: Isabella Stewart Gardner Museum, Art Museum Teaching, Marcus Institute for Digital Education in the Arts (MIDEA), Bank Street College, George Washington University, Museum Education Roundtable, Kress Foundation, University of Texas at Austin, Canadian Art Gallery Educators (CAGE), EdCOM/American Alliance of Museums, The Learning Project, Engage.org, Group in Education (GEM), Museum Education Division/National Art Education Association, and International Council on Museums/Committee for Education and Cultural Action (CECA). Back in 2011, I attended a fantastic session led by Kris Wetterlund and Sheila McGuire at the National Art Education Association conference about how the Minneapolis Institute of Arts was using iPads with their docents — and how they were training the docents to use this newly adopted technology. I remember sitting in the audience thinking: “A. I will probably never own an iPad myself,” and “B. Our docents will probably never use iPads.” It turns out I was wrong on both accounts — I got my own iPad 2 within a couple months of attending that session (I think Apple still owes Kris and Sheila their commission), and we now have about half a dozen docents using an iPad on their tours at the Saint Louis Art Museum — a number that I hope grows in the next year. So what’s the big deal with the iPad? Does it really add anything to a tour that we couldn’t already do without this device? A study from the Pew Research Center released earlier this year indicated that 19% of adults in the United States own a tablet computer, and that statistic is rising significantly (probably much higher by the time I write this). I also read somewhere that Apple has sold approximately 200-220 million iPads worldwide since the product’s first release in 2010. So I thought it was about time that I more fully utilized this device in my own teaching practice, and then lead a workshop for our docents on the ways in which the iPad (and tablet/mobile technology in general) can add a new dimension to the museum experience for our visitors. I personally began using my iPad on tours a little less than a year ago. My first experience was with a group of 2nd grade students from an city public school, and we were scheduled to visit the African art galleries. It had always been a bit of a challenge to make those galleries come alive, since they were small, dimly lit spaces with the objects up high in big plexiglass cases. Was there something I could load onto my iPad that would enrich the experience? I found a video of an African buffalo mask (similar to the one in our collection) being performed in a ceremony in Burkina Faso, so I downloaded that to my device just as I was heading from my office to greet the group. As I led them into the African gallery with the “Buffalo Mask,” I was nervous that something would go wrong and my iPad experiment would crash and burn. I popped out the mobile device, clicked play on the video, and quickly noticed that every student in the entire group was silent and paying very close attention to the video. I had intended on only playing about 20 seconds, but we actually stayed and watched about 3-4 minutes (not recommended, but it worked with this group). While the video of the African dance ceremony played, I invited the students to discuss everything they noticed in the video: the movements of the dance, the sounds of the drums, and the community gathered in the background. Then our discussion turned back to the “Buffalo Mask” before us in the gallery — a really great exploration that had the students looking more closely and connecting in a more meaningful way. Their level of interest had skyrocketed. Was this just because I brought this short video clip into the galleries with me? Was it this simple to deepen the level of understanding and engagement on my tours? I remember leaving this tour with a lot of excitement about using the iPad in the galleries, but questions about whether the focus was truly on the objects … or was the focus too much on the technology? “iPads on Tour,” written by Kris Wetterlund and Sheila McGuire for the Museum-Ed Blog. Nice short overview of key things to keep in mind when enabling docents and educators to use multimedia on the iPad to enhance their tours. Their best tip (and a “Golden Rule” for me) is Organize Your Stuff. I have used FileApp Pro, which they recommended, and it seems to serve my needs for bringing video and images together into an easy-to-access folder. This means I’m not fumbling around to find the content while I’m in the middle of my tour. 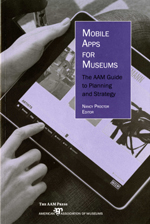 “Enhancing Group Tours with the iPad: A Case Study,” authored by Ann Isaacson, Sheila McGuire, Kris Wetterlund, and Scott Sayre, now a chapter in the American Association of Museums 2011 book entitled Mobile Apps for Museums. This more in-depth article discusses a study that the Minneapolis Institute of the Arts conducted on their docents’ use of iPads and visitor response. They found that “all of the museum visitors were engaged during the iPad portion of the tour” and that “all thought it added to their understanding of the works of art.” A good tip that you can pull from this article is that, like any gallery prop, the iPad or mobile device should be used judiciously to avoid making it the focal point of the tour. So why all this thinking about iPads and touring? Well, I decided it might be good to have a conversation with our docents about the benefits of bringing a iPad with you into the galleries. Therefore, last week I offered an open workshop for any interested docents — about 15 attended, and about 10 were interested but unable to attend. My workshop demonstrated a handful of ways that the iPad can enrich the museum experience, focusing mainly on ways in which additional content and context can be introduced to gain a deeper understanding of the objects themselves (again, the focus should always be on the art and objects, not on the technology). On our workshop tour, we discussed using the iPad in three galleries of the Saint Louis Art Museum’s collection: African art, Impressionism (mainly Degas’s sculpture), and contemporary art. I am going to quickly review the use of the iPad in these three areas, and link to some of the multimedia content we viewed in the galleries. African Art: For our time in the African galleries, I demonstrated two uses of the iPad. First, I showed how a tour guide could use a map application like National Geographic’s World Atlas to show students the location of Africa on the globe, and then zoom into the regions and countries that might relate to the objects on the tour. I have had a lot of success with this map app on my tours, and I find it more effective than paper maps or color print-outs. In addition to the map, I showed the video I mentioned above of the Buffalo Mask dance, which we all agreed would enrich and deepen visitors experience with the mask on view (not just school children, but adults too). After exploring the map and video, I discussed how important it is to keep your multimedia content to a minimum — in other words, do not have 3 videos to show along with a map for one stop on your tour. I recommend that docents choose approximately 3-4 multimedia items (photos, maps, videos, etc.) for their entire tour, and spread them out across the tour. Remember, you don’t want the iPad to become the focus of the tour. Impressionism/Degas: We moved up to the Impressionism and Post-Impressionism galleries, and I spent some time with the sculptures by Edgar Degas that our museum has on view. First, I quickly showed a video of Eadweard Muybridge’s ‘Horse in Motion’ images from 1878 along with our Degas Galloping Horse of a slightly later date. The museum label even refers to this experiment in capturing motion, and it was powerful to see these images and the Degas side-by-side. Then we moved to Degas’s Little Dancer of Fourteen Years to compare our bronze version (cast after the artist’s death) with hi-res detail images of the original wax and mixed media sculpture that Degas created himself (now in the collection of the National Gallery of Art in Washington). This sparked an interesting discussion of the appearance of our bronze, the surface textures, and the fabric, and I think we all left wanting to explore our Degas further. Contemporary Art: Finally, we discussed the various types of content one could bring into the contemporary art galleries. I focused primarily on artistic process, or artists in their studios. This is something I know visitors enjoy seeing, and I feel it deepens our understanding of the artworks and the artists themselves. I brought in two examples. F irst, I showed a video of Toots Zynsky, a contemporary glass artist, working in her studio to create, heat, and mold one of her well-known glass forms. We’ve had curators discuss her process before, but the video really helped the piece come alive in a new way. And finally, I ended the workshop with a video clip of Gerhard Richter painting with one of his squeegees — a process that visitors are always confused by. Seeing Richter carefully pull paint across his huge canvases certainly helped me gain a better understanding of these massive paintings. For me, this was a good place to start with our docents, and it was my goal to keep it simple. I know that iPads and mobile devices allow for many more types of experiences, including augmented reality (see excellent paper from Cherry Thian from 2012 Museums & the Web) or using real-time video applications (FaceTime, Skype, etc.) to bring artists, curators, or community members into the galleries for Q&A and dialogue. But for the human-centered experience that is the guided tour, these simple uses of the iPad can truly add a powerful dimension to the learning experience. What is your best use of the iPad on a tour or teaching experience? Are there ways we can push the best uses of mobile technology into tour experiences?